President Trump speaks during a "Make America Great Again" rally at Landers Center in Southaven, Miss., on Tuesday night. President Trump speaks to the media before leaving the White House to speak with electrical workers in Philadelphia. 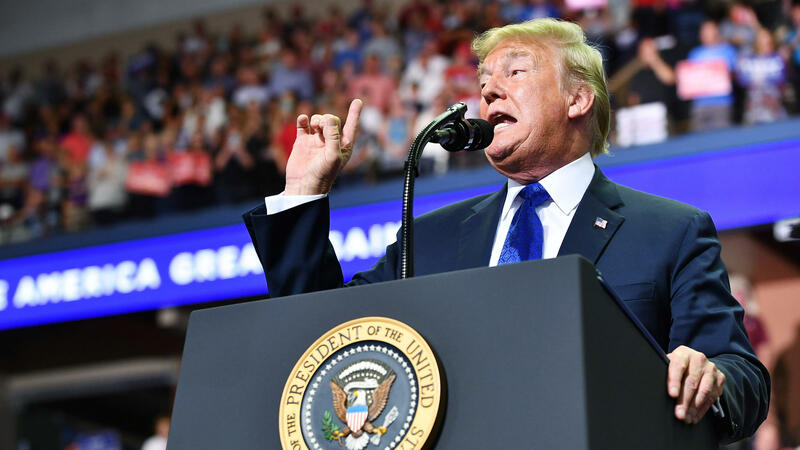 President Trump continued his defense Tuesday of his Supreme Court nominee Judge Brett Kavanaugh, mocking one of Kavanaugh's accusers at a Mississippi campaign rally. The latest move by Trump came just hours after he had highlighted the possibility of false accusations against young men in the midst of a cultural moment brought on in the past year by the #MeToo movement. 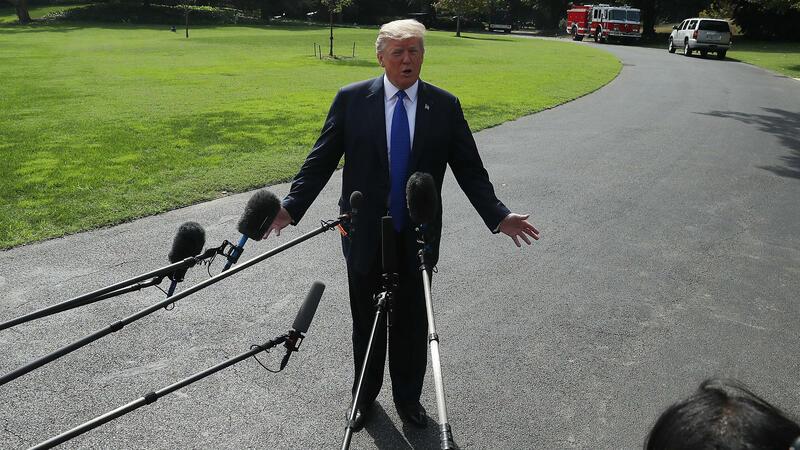 "I think that it's a very scary time for young men in America when you can be guilty of something that you may not be guilty of," Trump said Tuesday afternoon outside the White House. "This is a very difficult time." 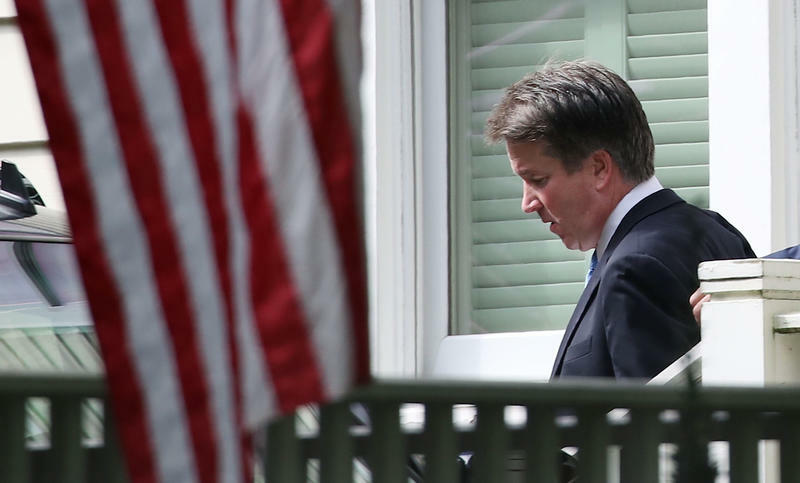 Kavanaugh's nomination remains in limbo this week, as the FBI looks into allegations of sexual assault made by numerous women. Senate Majority Leader Mitch McConnell, R-Ky., vowed again on Tuesday to vote on the nomination by the end of the week, insisting that the results of the FBI inquiry be kept private, for senators only to see. Late last week, the Senate Judiciary Committee heard from both Kavanaugh and Christine Blasey Ford, who alleges Kavanaugh drunkenly pinned her down on a bed and groped her against her will at a high school gathering in 1982. Scrutiny has been building this week on Kavanaugh, not only because of the accusations, but because of his testimony at that hearing. 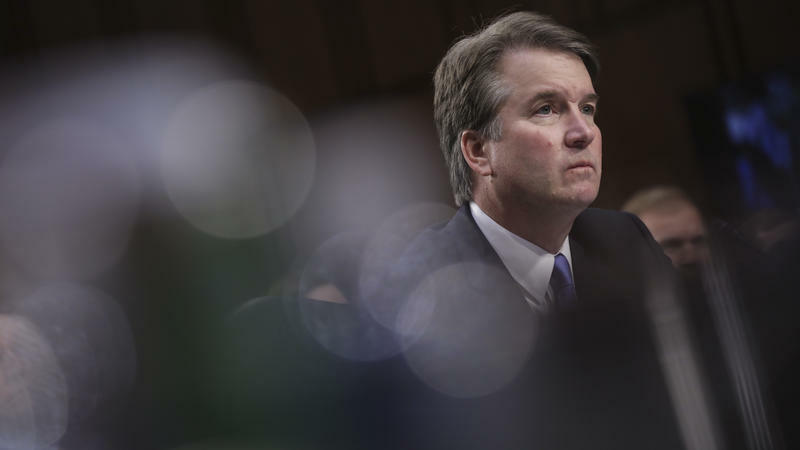 A number of Kavanaugh's classmates have publicly said he misrepresented or lied about his drinking habits when he was in school, while he testified under oath in front of the Senate. President Trump said that if Kavanaugh did lie to Congress, then "that would not be acceptable," but the White House has said the administration does not feel that Kavanaugh lied under oath. At the same time, a backlash to that backlash has begun brewing in conservative circles. 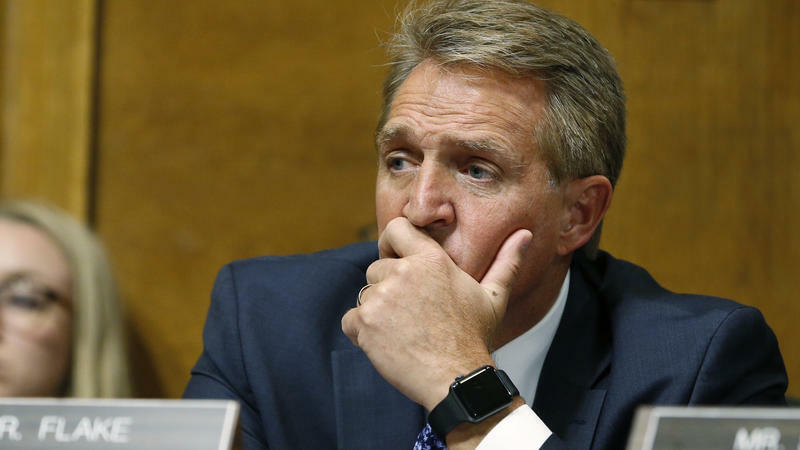 Many Republican senators have said they view the accusations and subsequent questions as desperate delay tactics on the part of Democrats. "A vote against Kavanaugh is a 'yes' vote for more of these despicable tactics being used time and time again in the future," said Senate Majority Whip John Cornyn, R-Texas, on the Senate floor Tuesday. President Trump, as well as his family, has raised fears about the possibility of politically motivated false accusations. Trump himself has been accused of a range of sexual misconduct, from harassment to assault. He has denied every accusation. "You could be somebody that was perfect their entire life and someone could accuse you of something," Trump told reporters Tuesday afternoon. "You are truly guilty until proven innocent." And the rally in Southaven, Miss., on Tuesday night, Trump went further. He mocked Ford's testimony, noting she said she could remember how many beers she consumed but couldn't remember details about the location of the house where she says the assault happened or how she got home that night. Trump asked a series of questions, acting out both sides of Ford's congressional testimony to laughs and applause from the crowd. "What neighborhood was it in? 'I don't know.' Where's the house? 'I don't know.' Upstairs, downstairs, where was it? 'I don't know but I had one beer, that's the only thing I remember!' " Trump said. "And a man's life is in tatters! A man's life is shattered." After Ford's testimony last week, Trump had called her a "very credible witness." "It's a damn sad situation," Trump told the roaring crowd on Tuesday, after chants of "We want Kavanaugh! We want Kavanaugh!" had quieted. "Think of your son," Trump said. "Think of your husband." Michael R. Bromwich, one of Ford's lawyers, called it a "a vicious, vile and soulless attack" in a post on Twitter. Trump's comments echoed a message his son, Donald Trump Jr., relayed in an interview that aired this week on DailyMailTV. Trump Jr. said he fears more for his sons than for his daughters in the age of #MeToo. "I got boys and I got girls, and when I see what's going on right now — it's scary," Trump Jr. said. "The other problem is for the people that are real victims of these things, when it is so obviously political in cases like this, I think it diminishes the real claims." The idea that people in the U.S. are wrongfully "guilty until proven innocent" is an idea that wasn't manifesting itself politically on the right until last week, GOP pollster Frank Luntz told The Washington Post. "In this era of #MeToo, there are a lot of men — and some women — who believe that justice no longer exists in America," Luntz said. This raises the possibility of conservatives rallying around the Kavanaugh confirmation fight and cutting into the enthusiasm advantage among Democratic women, many of whom were politically activated when Trump defeated Hillary Clinton in 2016. 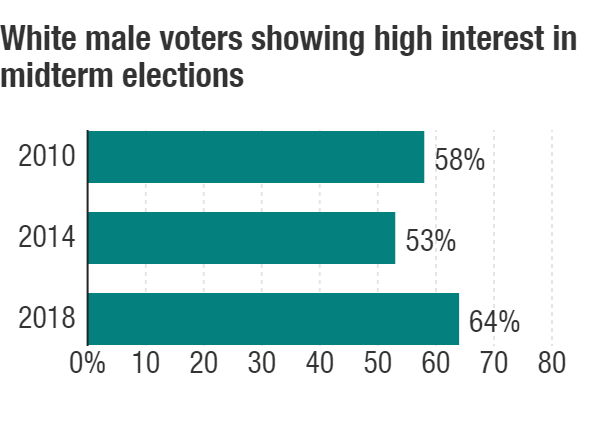 NPR's Danielle Kurtzleben reported recently on how women have swung further toward the Democrats this year than in elections going back at least two decades. 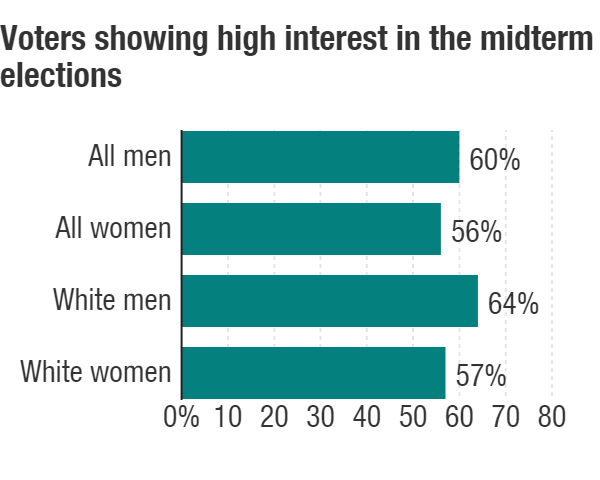 An NBC News/Wall Street Journal poll from Sept. 23, just a week after the allegations were known, showed interest in the election among white men at 64 percent, higher than in 2010 when Republicans retook the House and 2014 when the GOP took control of the Senate. President Trump has ordered the FBI to conduct a limited "supplemental investigation" into his Supreme Court nominee, Brett Kavanaugh, to update the judge's background check, following a deal struck by Senate Republicans to move the nomination forward. The move comes after Senate Republicans agreed to delay a vote on Kavanaugh's nomination to give the FBI one week to look into the allegation of sexual assault brought against him by Christine Blasey Ford, which the federal appeals court judge denies.